I heard from Vincent Carmody of Listowel, a local historian and author. He writes that Thomas F. O’Sullivan and his book are not forgotten. Story of the GAA received at least five mentions in The G.A.A., A People’s History, a 2009 book by Mike Cronin, Mark Duncan and Paul Rouse. When in Listowel, [O’Sullivan] was the driving force, both as a player and administrator of the local G.A.A. club. He later served as an administrator at both County and National level of the Association. He is credited with the proposal of Rule 27, of the G. A.A.s rule book. This came into force in 1902 and it read, ” any member of the association who plays in any way, rugby football, jockey or any imported game which is calculated or injurious affect our national pastimes, is suspended from the association” . This rule was commonly known as, The Ban. It was for a long time rigorously enforced, indeed in 1938, the then President of Ireland, Douglas Hyde, was banned from the G.A.A. , for his attendance at an International Soccer match in Dublin. The rule was deleted in 1971. A journalist’s book about the early decades of the Gaelic Athletic Association this year quietly reached the 100th anniversary of its publication. 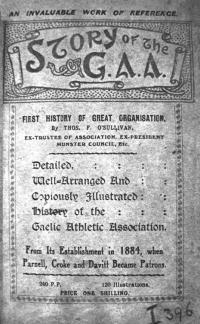 Thomas F. O’Sullivan’s Story of the GAA was based on an earlier series of newspaper articles. The book’s 1916 publication has been lost amid all the attention to the same-year Easter Rising. Even the 1916 entry of the special 1913-1923 centenary section of the GAA’s website overlooks the book, written by one of its own members. You can read the organization’s 28 May 1916 official statement after the uprising. O’Sullivan was a GAA official and the book presents a highly simplistic notion of the Association’s past beginning with the seven pioneers who met in Thurles in 1884 to reawaken the Gaelic nation through sport and taking the narrative up to 1916 by recounting details of major personalities, decisions taken by the Central Council and recording the results of matches. Although there is no explicit mention of the Easter Rising as such an inclusion would have meant that the book would not be approved by military censors, there is an implicit celebration of the Rising as those GAA men who took part are included in the list of GAA personalities. Although not a widely researched history, as it is more of a contemporary account, O’Sullivan’s book is important as it sets out an accepted chronology that is rarely challenged by subsequent authors. This chronology, while celebrating the games of the Gael, primarily revolves around the role of the GAA in reawakening the national spirit. O’Sullivan’s book does receive several mentions in The GAA & Revolution in Ireland 1913-1923, edited by Gearóid Ó Tuathaigh, a 2015 commemorative publication specially commissioned by the GAA. O’Sullivan was a Kerryman, born in Listowel, according to a short History Ireland bio. He wrote for the nationalist Freeman’s Journal. This entry was posted in Arts & Culture, History, Sport and tagged 1916 Easter Rising, GAA, Gaelic Athletic Association, T.F. O'Sullivan on November 25, 2016 by admin.